Barbara Kingsolver Captures The Feeling Of Being 'Unsheltered' Kingsolver's new novel opens with a family suffering a slew of disappointments — job losses, aging parents and kids returning home — then jumps back in time to draw subtle parallels with the past. For years now, my mother has been a fan of Barbara Kingsolver's work, urging me to read it when I had time. 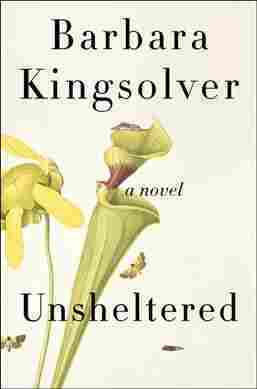 I finally found those elusive moments recently and dug into Kingsolver's newest novel, Unsheltered. It is incredibly relevant, painfully familiar, gorgeously written — plus, there's a mother-daughter relationship at its center that so perfectly encapsulates a particular middle class, largely white generational divide that it could be used as a teaching tool for Baby Boomer parents and their Millennial children across the nation. Unsheltered opens with a slew of disappointments: There's the ho-hum tragedy of middle-class life in our contemporary U.S. — Willa, named for author Cather, is a journalist and editor whose magazine was recently shuttered, and her son-of-Greek-immigrants husband Iano had a nice tenure track position in Virginia until his school closed; he's now back to adjuncting for little pay. Willa's mother and aunt died in the past year, her adult daughter, Tig, recently returned from a long stint in Cuba and has moved back in, and Iano's diabetic and increasingly grumpy father Nick is living with them too. But more dramatic tragedy strikes when Willa and Iano's son Zeke calls weeping: his girlfriend Helene has just died by suicide, leaving Zeke and their newborn alone and adrift. Soon Zeke and his baby boy arrive at the crumbling house in Vineland, New Jersey that Willa and Iano have just moved into (it's Willa's inheritance from her aunt). Though Willa and Iano's marriage is as good as it can get, their children don't get along, no one gets along with Nick, and house itself is in such dire condition that fixing it will be impossible on their current salary. Indeed, these are the times we live in. What Willa and Iano were promised — that they would be rewarded for hard work, that sacrifices like moving their kids around for Iano's teaching positions would be worth it — has not come to pass. People aren't retiring because they can't afford to; progeny are moving back in with their parents; multigenerational households are increasingly common. Worst of all for Willa, there is no easy solution to these woes. But Unsheltered isn't only about Willa and her family during the 2015-2016 primary season, when our current president — then a candidate Willa calls "the Bullhorn" — was shocking many with his success. It is also about a family living on the same plot of land some 150 years prior. This dual storyline has the potential to be gimmicky, but Kingsolver makes certain that it isn't, especially as the parallels between the time periods and families are not overt, and it's only over time that we connect them. 'Unsheltered' echoes how many of us ... are feeling these days — cheated out of a future that was never really owed us to begin with and exhausted from attempting to get others to understand how we see the world. Thatcher Greenwood is the inhabitant of the 1870s house, along with his new wife Rose, Rose's little sister, and their mother. Thatcher is a schoolteacher and scientist who's moved up in the world through his marriage to Rose, but isn't able to provide for her as she would wish. Their Vineland is under the thumb of a man named Captain Landis (a real historical figure, as are several others in this timeline), who planned the town as a virtuous utopia devoid of drink or strife — though in reality Thatcher finds that his students keep needing to leave school in order to get jobs or take care of siblings while their poor parents work for the Captain Landises of the world. Thatcher's friend, a journalist running the only paper in town that dares to criticize the much beloved Landis, tells him that "the peasants don't like hearing how they've been used, paying for land that will go back to Landis the day they lose their first crop. They refuse to believe they're getting tricked into building wealth for the masters of this town." It is in moments like these that the parallels between then and now begin to come strikingly clear. Unsheltered echoes how many of us, of various generations, are feeling these days — cheated out of a future that was never really owed us to begin with and exhausted from attempting to get others to understand how we see the world. But it also makes space for the small moments of comfort and joy that are so often missing in a time when we wield cynicism and irony as shields to protect our softer feelings. We see that joy in Willa and Iano's loving marriage, in Tig's love of the planet, in Thatcher's friendship with the scientist Mary Treat, and in other minute pleasures. Kingsolver doesn't give us solutions, but she reminds us to take comfort in one another when we can, and that hope is necessary even when all seems lost.